As my original career was in biology, when I started working with stories I naturally wanted to consider the natural history of stories, including their life cycles. Now this is a much more difficult thing with stories than with tadpoles or mushrooms, because stories mingle and morph in ways that creatures can't. But here is try at it, based on my experiences and what I've read. I've been pondering this cycle for a long time and playing with it in my mind, and this is what I've got to lately. Of course this cycle will be nothing new to anyone who thinks about stories, and it's obviously a greatly simplified metaphor, and I'm merrily making up terms as I go. But this sort of thing can provide a scaffold for discussions about helping people tell and share stories to attain goals. In the narrative cycle, pockets of stillness and eddies of movement are constantly forming and dissolving. Sometimes a person has an experience but is unable to tell others about it or even think about it for years. This can happen because the experience is painful, or it can just happen benignly, because nothing calls the experience to mind. Conversely, sometimes a story takes on a "life of its own" and swirls about with great energy in a person or family or group or society for a time. Notice that interpretation takes place during direct experience and during story listening. Recall of a story requires selection, usually for a purpose, though the purpose is not always known to the selector. As stories are told over and over they usually solidify and take on a form, though that form can change later. Another thing to notice is that I did not mention events in the narrative cycle. Not all events create experiences, and not all experiences require events. Now if you will permit me an aside, I will illustrate this by introducing you to an old friend from my days studying animal behavior. This is a conceptual model of information use in decision making which I've found useful for thinking about all kinds of decisions, be they of lizards or birds or people. External information is what we typically think of as information - what time it is, the temperature outside, how many seeds are under a tree. Internal information is about one's internal state - how hungry I am, how tired, how late. Relational information is about how it all fits together - that if I'm hungry and tired, and it's cold outside and there is little food left, I am in danger. All of these types of information are required for decision making; if any is lacking the equations will all be off. The reason I bring this up is that stories can come about from experiences involving any or all of these informational sources, and this is not obvious. We typically think of stories as arising from external experiences caused by events, such as when a tree falls on a house. But stories can also come from internal or relational experiences, and those stories are sometimes harder to spot in the wild. An internal-experience story might be one where I realize my memory is not what it was. A relational-experience story might be one where my family realizes why my memory is not what it was. Or where a scientist realizes why the memory of so many people is not what it was. So, adding purposeful storytelling to the picture, you get something like this picture. 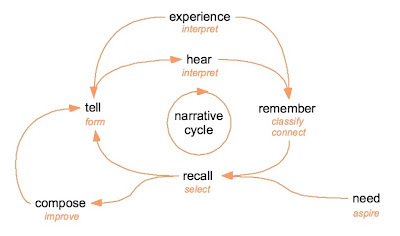 Now the narrative cycle has another inflow: the need for a story to suit a purpose. And it has a sort of bud where a purposeful story is composed (out of the material of recalled stories) before being told and entering the inner portion of the narrative cycle. I've marked some points that jump out to me as being both vulnerabilities of the narrative cycle and opportunities to help it better meet the needs of groups and communities and organizations. I'll go around the little blue dots in clockwise order. People keep track of millions of stories naturally over the course of their lives. Families, groups and societies do this too. But when people have a particular purpose in mind, helping them collect and store the most useful stories together with the most useful metadata can improve this process. The goal of questions both for and about stories is to make it more likely that the right story will be found when it is most needed. Of course, asking such questions and collecting such answers is not anything new or unnatural; it's only what people have always done. 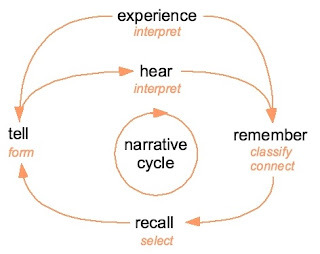 If you listen to anyone tell a story in person, they will almost always surround it with some metadata about why they are telling the story, where they heard it, who it happened to, why you should listen to it, who you can feel permitted to pass it on to, and so on. And the people who listen to the story often ask questions and add their own metadata while the narrative event is going on. When we put questions on a story-elicitation web form, we are just trying to mimic some of these processes. When a person has an experience and then tucks it away in their memory, it can be hard to get out again. Storytelling exercises can help people bring stories out of the still place where they have been living and into the busier part of the narrative cycle where they might be more useful to others. Note that this label connects to two locations: connecting need to recall for a purpose, and simply helping along the natural cycle. 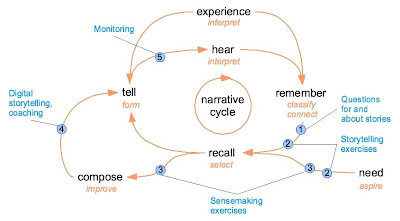 Sensemaking exercises help people integrate recalled stories into something larger, either for communication (in which the purpose of the exercise is what is built: the noun) or for sensemaking (in which the purpose of the exercise is not what is built but what happens during the building: the verb). Some sensemaking exercises have both purposes, and for some the purpose is only apparent afterward. This is where much of the "telling side" of organizational storytelling is found: where purposeful stories are refined, packaged, and delivered. When people have a goal in mind much can be done in this area, both in terms of preparing particular stories for maximal impact and in terms of helping particular people improve their storytelling skills. 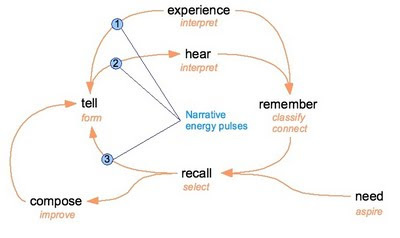 This point is connected more to purposeful elements of the narrative cycle, though it can also be used to connect the "hear" element of the cycle to the "need" element (I did not draw the line as it would have been messy). Paying attention to the stories people tell, either without intervention or in response to the telling of a purposeful communicative story, is an essential element of nearly every goal-oriented story project. This need not take the form of expert interpretation, however; people in the community can monitor their own stories and feed them into sensemaking exercises or observations themselves. The last two observations about vulnerabilities/opportunities in the narrative cycle require their own pictures, as they involve multiple points in the cycle. Storytelling environments can be physical places such as a community center or online spaces like (and here you will have to excuse me) Rakontu. Such environments keep the narrative cycle going in three ways (going round clockwise again). First, such environments help people store information and recall the right story at the right time. In a physical setting this is sometimes done by using physical objects as memory aids. (Take an older person into a historical museum if you want to see that happening.) In an online setting this can be done with pictures as stand-ins for physical objects and with questions for and about stories. 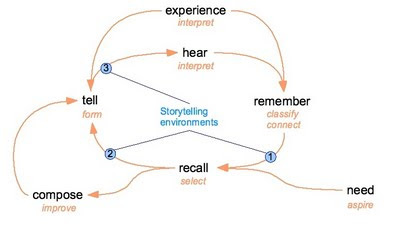 Secondly, storytelling environments create a safe place for people to tell recalled stories to others. And finally, they create a safe place for people to hear stories (which is the less obvious part of narrative safety). The building of a common story bank improves trust, which improves the story bank, which improves trust. I've saved my favorite part for last. This was an idea I came across around 2000, quite by accident. What happened was, I was working in my little dark office at IBM Research when I made a discovery, solved some problem, can't remember what. I rushed out of my office and looked for people in the hallways to tell my Eureka story to. I found a few people and tried to spill out the story, but nobody was interested in hearing how I had got a troublesome screen widget to work (or whatever it was). So the story died, and I soon forgot about it. But later I reflected on that experience and came up with what I call the "narrative pulse" idea of organizational narrative. When something happens to a person, they (sometimes, not always) have a little pulse of energy or motivation to pass it on. If you graphed it, it would look like a little earthquake. But usually, because no one happens to be in the right state to receive the story, the pulse of energy dissipates and the story is gone. But every story is needed somewhere, by somebody, sometime. In that sense a story is like a wisp of steam that, if put to good use, could provide power; but many of the best stories dissipate and are lost. One way to capture story steam as it rises would be to give people a "Eureka!" button or sheet of paper or phone number or ... something, so that the energy can be captured and put to good use before it dissipates. There are of course all sorts of "hotlines" for this or that emergency, but I've never seen one for telling stories whose purpose is to help other people facing the same situation. As far as I know, nobody has ever tried to harvest narrative pulses in real time. At least not recently. Over time I've come to realize that there are other, smaller pulses, something like echoes of the first and largest pulse. The second is when a person first hears a story: they may be inspired to pass it on right away. Again the steam may escape and be lost if no one is ready to receive it. The third pulse is when a person suddenly recalls a story, often as the result of something someone said. Again they experience a little pulse of motivation to pass on the story, and again it is often moot. During all of these pulses, if a person has a way to quickly and easily do something, they will probably take advantage of it, especially if it becomes a habit. Systems that help people tell each other stories, perhaps in order to learn from each other, should think about these pulses and how to make use of them. My guess is that the first pulse is the most useful to support with a ready mechanism. But the others provide some energy as well and can be tapped. For example, when a person is reading a story in an online forum, it should be easy to do something right away in relation to the story, to put the pulse to use. Also, there used to be people in every village, story caretakers, whose understood role was to listen to stories, remember them, organize them, and pull them out again when there was a need for them. In some cultures they had formal titles like griots, shanachies, shamans and bards, but in other places they were just the community elders. Story caretakers sometimes learned through long practice, sometimes in apprenticeships handed down from parent to child. They watched changes in the community as they remembered its history. They could respond to a situation with an appropriate story based on patterns across time and space of which they alone were aware. They knew what questions to ask to help people tell the stories they needed to tell. And they could help groups use their old and new stories to settle disputes and make decisions together. In essence, story caretakers got to know the community's stories and helped the stories get to where they needed to be. And they did a better job than any outside facilitator or web platform could ever hope to do. In a sense, much of the work on the listening side of organizational and community narrative has to do with this societal change, this new remoteness, and with trying to put back things we have lost. They can never be put back as they were, but perhaps we can evolve something new. Next: Telling, doing and listening.